RGBHV — The CrossPoint Plus 1616HV models switch separate horizontal and vertical sync to ensure proper sync polarity, providing a more stable image. All models also switch RGBS, RGsB, HDTV, component video, S-video, and composite video. Ultrawideband RGB video bandwidth — The CrossPoint Plus 1616 models provide a minimum of 425 MHz (-3dB) RGB video bandwidth, fully loaded. Designed for resolutions of 1280 x 1024 and up, the CrossPoint Plus 1616 maintains original signal integrity. Digital Sync Validation Processing (DSVP™) — Extron’s exclusive DSVP verifies active sources by scanning all inputs for active sync signals. DSVP then transmits the horizontal and vertical scan rate information to the user via any type of control system using RS-232 and RS-422 commands. Channeltochannel isolation — The CrossPoint Plus 1616 provides excellent isolation between channels and extremely low electromagnetic emissions perfect for minimizing signal leakage in high security or government environments. I/O grouping — Allows the matrix to be virtually divided into smaller sub-switchers, making installation and control easier. allows specific outputs to be grouped together such as those designated for a specific video format. TripleAction Switching™ (RGB delay) — RGB delay blanks the screen when the matrix switcher switches to a new source. The new sync signals precede the RGB signals, so there is no glitch shown during the transition. The time delay between the RGB and sync signals is user adjustable up to five seconds. QuickSwitch Front Panel Controller (QSFPC™) — QuickSwitch FPC allows for touch-of-a-button input and output selection. Extron’s QuickSwitch technology eliminates the learning curve usually associated with switching the inputs and outputs of a matrix switcher by using a tactile front panel button for every input and output. Front panel I/O label windows — I/O buttons may be labeled by any Brother® P-Touch labeler or Extron label software, which ships with every Extron matrix switcher. Each input and output can be labeled with names, alphanumeric characters, or even color bitmaps for easy and intuitive input and output selection. View I/O mode — Allows user to easily see which individual inputs and outputs are actively connected. 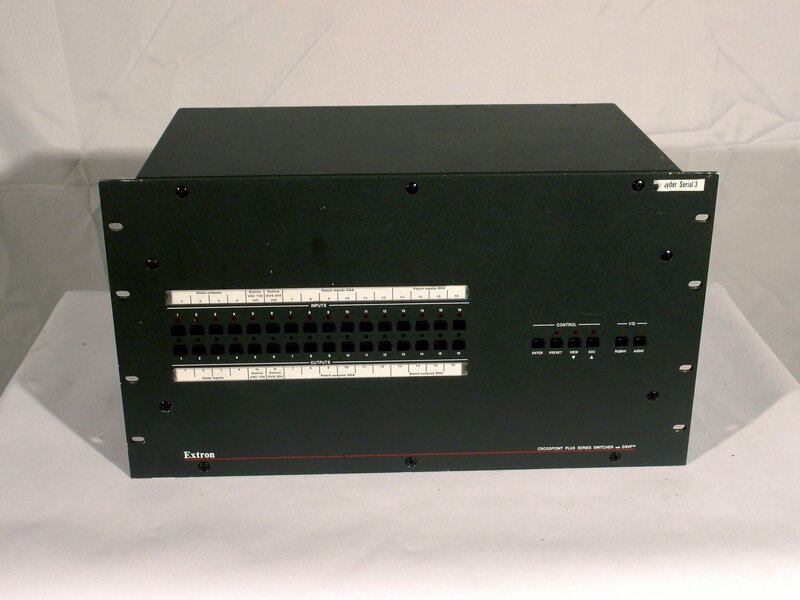 Available from the front panel or RS-232 and RS-422 control. Global presets — Individual I/O configurations may be saved and recalled either from the QuickSwitch front panel or RS-232 and RS-422. This timesaving feature allows you to set up I/O configurations and keep them in memory for future use. RS232 and RS422 control — The CrossPoint Plus 1616 matrix switchers offer RS-232 and RS-422 control, allowing the switcher to be controlled via a third party control system. Simple Instruction Set (SIS™) — Extron’s SIS is a set of basic ASCII code commands that provide simple control through a third party control system. Instead of programming in long, obscure strings of code, SIS makes it easy to operate an Extron product using RS-232 and RS-422 control. Control software — For RS-232 and RS-422 remote control from a PC, Extron ships our Windows®-based with every matrix switcher. This icon-driven software uses a graphical, drag-and-drop interface to make I/O configuration and other customization functions simple and convenient. This software also offers an emulation mode for configuration of an offsite matrix switcher; the I/O configuration may then be saved for future downloading to the matrix switcher. 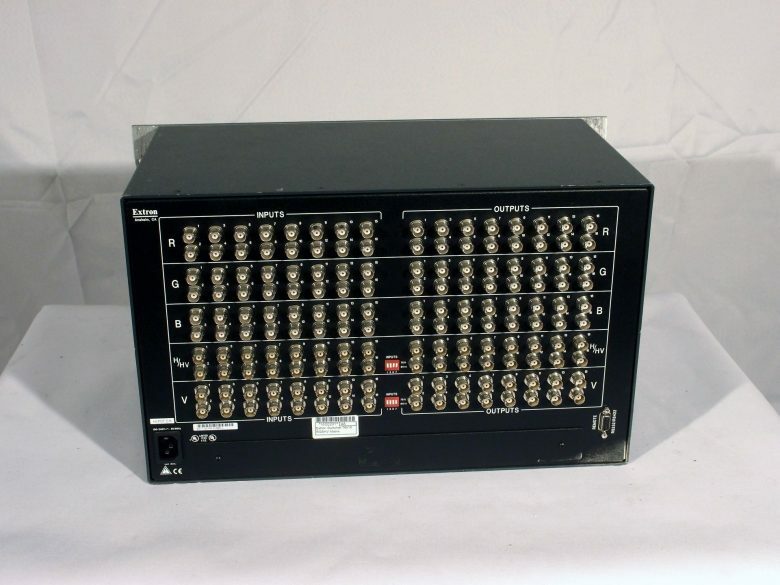 MCP 1000 and MKP 1000 control — Utilizing the MCP 1000 Master Control Panel and any combination of MCP 1000 slave control panels or MKP 1000 control keypads offers the flexibility to control a CrossPoint Plus 1616 matrix switcher from a remote location. Both remote control options are easy to use and provide tactile buttons for quick selection. Each MCP 1000 panel may be used for one-button switching for a particular output and selecting global presets. Each MKP 1000 keypad may be used to select a different input or select a preset. Input audio gain and attenuation (adjustable via RS232 and RS422 or front panel) — The CrossPoint Plus 1616 matrix switchers allow users to set the level of audio gain or attenuation (-24dB to +9dB). Individual input audio levels may be adjusted so there are no noticeable volume differences between sources. Front panel security lock out — If a CrossPoint Plus 1616 matrix switcher is installed in an unsecured environment, an optional security lock out feature may be implemented. During lock-out mode, a special button combination is required to operate the front panel controller. Internal international power supply — The autoswitchable, internal power supply provides worldwide power compatibility.